CERRITOS — A fundraising reception for Melissa Ramoso, a candidate for Artesia City Council in the Nov. 5 election, will be held on Tuesday, Oct. 29, from 7 to 9 p.m. at Goldilocks, 11489 South St., Cerritos. 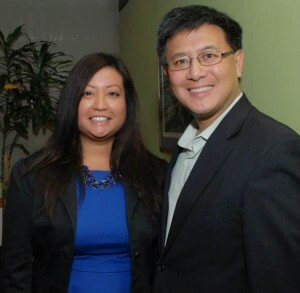 Artesia City Council candidate Melissa Ramoso with State Controller John Chiang. State Sen. Ted Lieu (D-Torrance) and actress Tamlyn Tomita will be the featured speakers. Ramoso is one of six candidates for three seats on the council. Also running are incumbents Sally Flowers, John P. Lyon and Victor Manalo, insurance broker Manu Patel, and licensed financial advisor Ali S. Taj. Born in Downey, Ramoso is a product of the ABC Unified School District and graduated with honors from Gahr High School. She earned her B.A. in political science at UC Irvine. She is an Artesia resident and vice president of Friends of Artesia Foundation. Over the past decade, she has served and advised federal and state legislators. Currently, she is deputy district director to Sen. Lieu, advising on health care, military and education policy. Her passion for service comes from her parents, who immigrated to America and helped others in government jobs. Her father also served in the U.S. military. “My top priorities are: improving the quality of life for all our neighborhoods; strengthening our local economy; and making City Hall more responsive to the people,” Ramoso said. Her endorsers include State Controller John Chiang, State Board of Equalization member Betty Yee, Assemblymembers Rob Bonta and Al Muratsuchi, former Assemblymember Tony Mendoza, Los Angeles Community College Trustee Mike Eng, ABC Unified School Board Clerk Lynda Johnson, Artesia City Councilmember Miguel Canales, Artesia Planning Commissioner Larry Natividad, Artesia Parks and Recreation Commissioner Lee Natividad, Cerritos Mayor Pro Tem Mark Pulido, Cerritos City Councilmember Joseph Cho, Cerritos Fine Arts and Historical Commissioner Nora Benzon, and Cerritos Planning Commissioner Becky Lingad.